What Was in all Those Pouches from 90s Comics? Why do jeans have 5 pockets? I never have anything to put in the tiny little 5th pocket that resides just above the front right pocket. Maybe you can fit a Pokémon card in there? Whatever. As if. Yeah, I just used references from the 90s. Really, why not? I’ve got articles to write! I don’t have time to wonder if something is played out! You know what is NEVER played out? 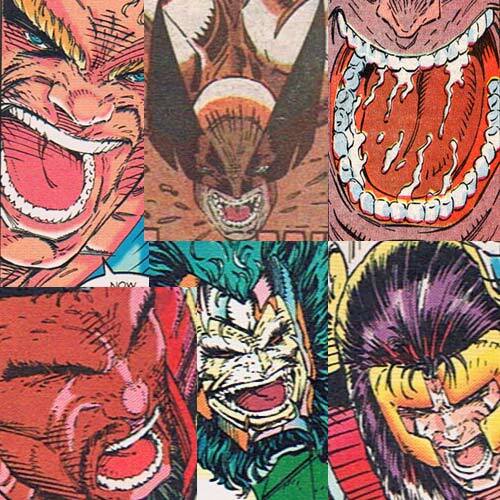 The art style of 90s comic books, particularly the x-tra x-tremeness popularized by Rob Liefeld. 5 pockets jeans weren’t enough for Rob Liefeld. He turned his baseball cap around, picked up his pencil, and drew a gazillion mabillion pouches everywhere. But what was in all those pouches from 90s comics? Well, read on. Through extensive research, we now have a answer. 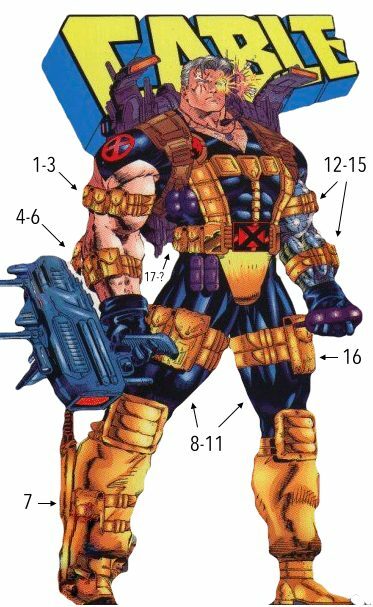 And we’ll illustrate this using Cable, the most pocketed of all 90s comic characters. Pouch #1: This pouch held items that might come in handy in the field. It includes, but is not limited to: a compass, emergency rations, a flint, medical supplies, steel and magnesium powder, wire, maps, thin rope, a rain poncho, flashlight, and multi-tool. Pouch #2: Big ammo for Cable’s big gun. Pouch #4: Batteries for his eye and lube for his arm. Pouch #5: Gold Bond medicated powder. Pouch #7: Cable’s feet, to keep them from having to be drawn. Pouch #8: It turns out that Cable is a bit of a packrat, with a touch of sentimentality. Bent paperclips, a #2 pencil with teeth marks, a frog caught by Hope, a Cable Marvel Select action figure, and 3 old grocery lists are contained in this pouch. Pouch #9: Cable also carries a lot of stress. In order to cope with that stress, he has taken up knitting, meaning he always has on his person some spare yarn, tiny scissors for said yarn, and a couple knitting hooks. Pouch #10: Leftover stuff from Batman’s utility belt, purchased at a reasonable ‘Buy it Now’ price from eBay. Pouch #11: Index cards containing notes for in-combat banter or rebuttals against long villainous monologues. Pouch #12: Teeth. Lots and lots and lots of teeth. Pouch #13: A Chipotle burrito, wrapped in foil. It’s a steak burrito with white rice and black beans, pico, hot salsa, sour cream, and cheese, but no lettuce, as lettuce gets wilty over long missions. Pouch #16: Grit for all the gritty X-Force comic needs. Pouch #17: Rob Liefeld’s talent. Unfortunately we can’t see behind Cable, but why wouldn’t we assume those pouches wouldn’t wrap all the way around. I’m assuming, in fact, that there is a fanny pack back there. 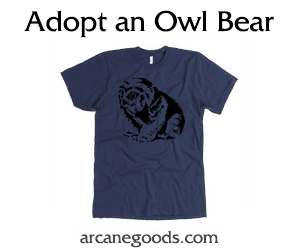 In all sincerity regarding the snark and sarcasm above, we kid because we care. Rob Liefeld created and developed a lot of our favorite 90s comic characters that exist to this day, and we have not forgetten that much. Cable, Deadpool, Domino, Shatterstar, and many more from his long tenures on New Mutants, X-Force, X-Factor, and more were Liefeld creations. But what was considered cool then looks ridiculous now, so why not have a little fun with it. Click here to learn what is really in the pouches of a Special Foces soldier like a Navy SEAL. Military Equipment: What Fills the Pouches of Army and Navy Special Forces?